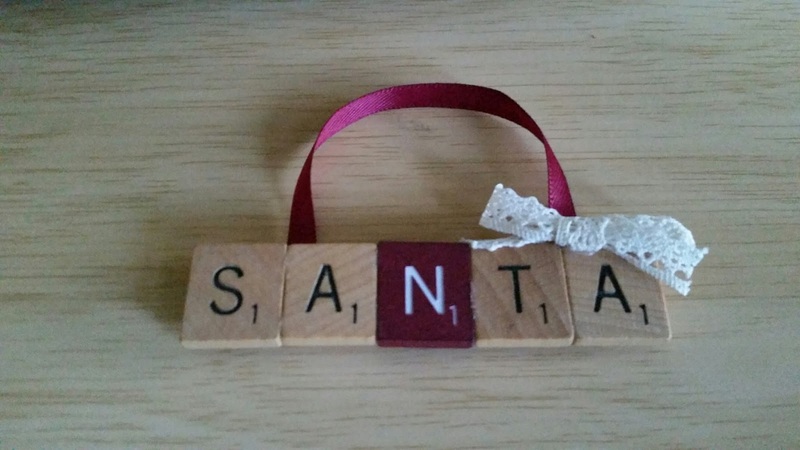 Confessions of a Holiday Junkie! This years Magical Holiday Home Ornament swap was no disappointment. Lots and lots of thought and work goes into each years ornament choices. 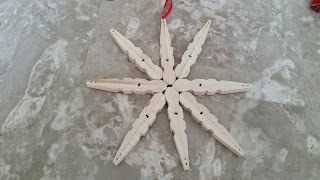 We sign up in January and have until Mid June to complete our ornaments. You pick one, ponder your choice and then go another route. Sometimes more then once. This year I was trying to use up supplies I had on hand and ended up with several different choices, but ended up with scrabble ornaments. It wasn't my most creative choice, but I do like how they came out and hope my friends enjoyed them. 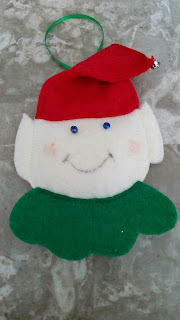 Some were personalized with their name, others said things like Santa, Joy or Snow. Now here are the amazing ornaments I received in my box. A stuffed and hand painted snowman. 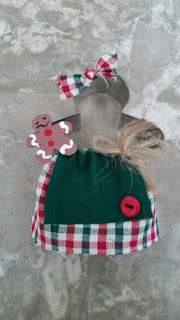 A gingerbread cookie cutter.... LOVE! My first thought was WOW...that does not look easy. 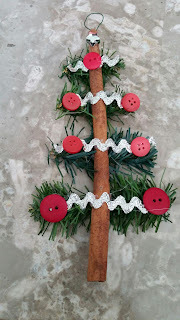 A cinnamon stick Christmas tree. 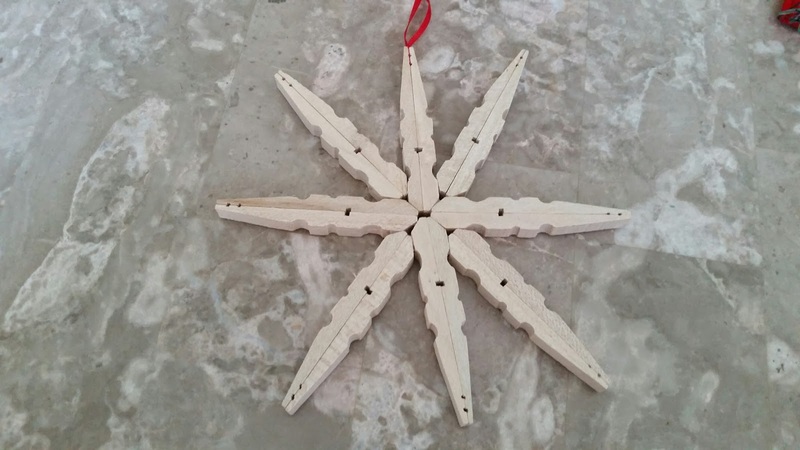 A star made out of clothes pins. This ornament is an Eye Spy game. 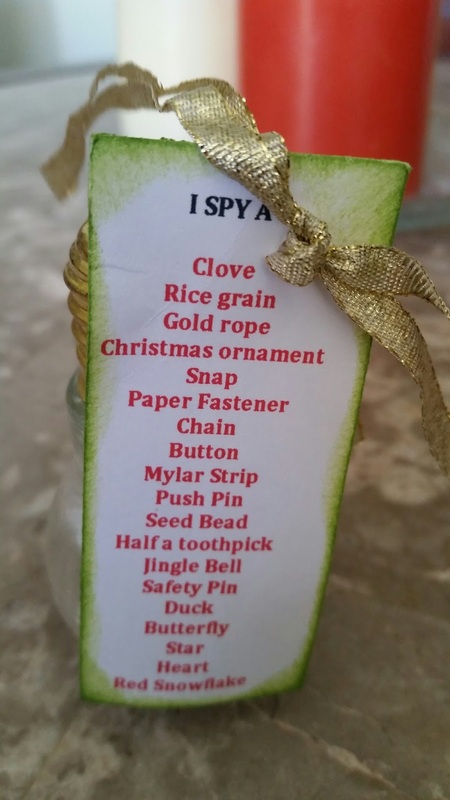 She attached the list and inside the light bulb was a bunch of little mini things to find. 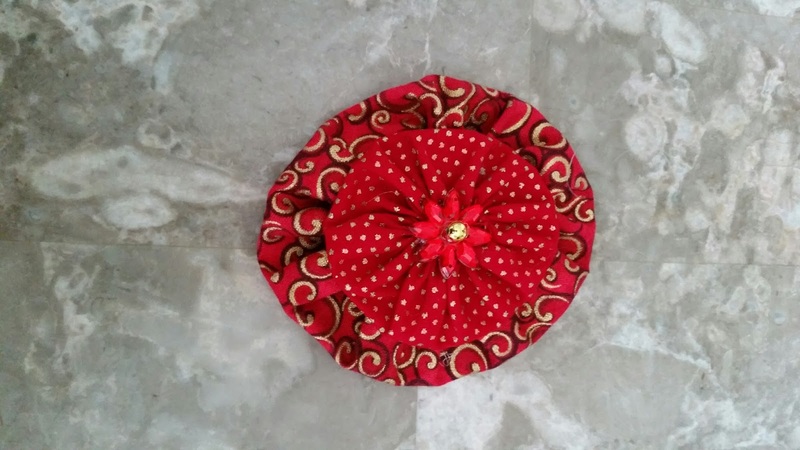 This one is perfect for kids in the family. 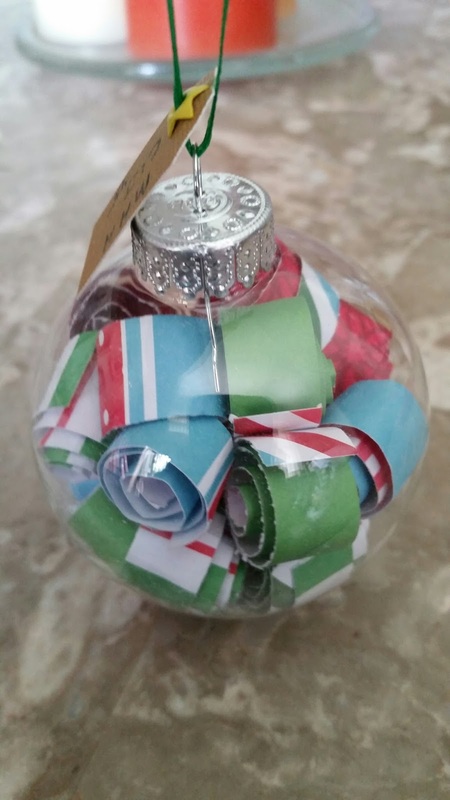 Paper curls inside a glass ornament. This one had to have taken a wee bit of time. Probably more patience than I have. A twig and ribbon tree. 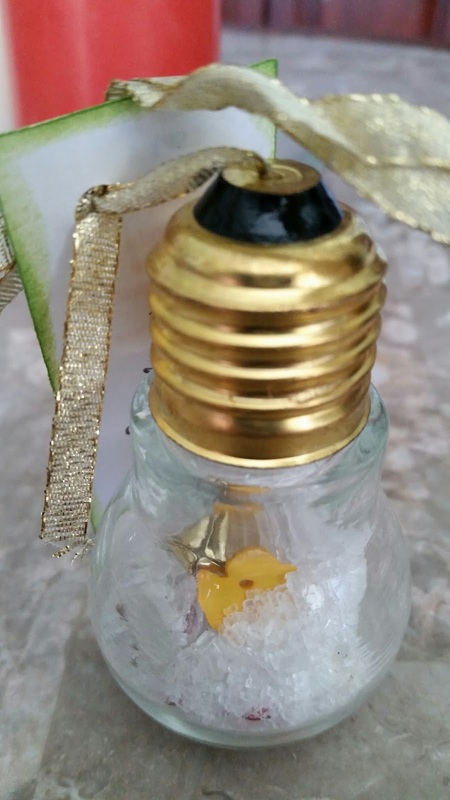 Such a simple idea, but yet super cute! 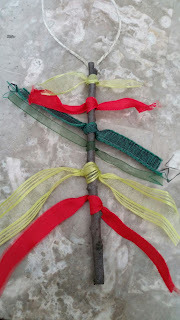 Now, you might of not been making ornaments in Spring, but have you thought about ornaments you might like to make for this coming year. Trust me when I say, early is better. The hobby stores will start carrying supplies soon and time will pass you by before you know it. Start scoping out Pinterest now and get that board going. Don't forget to have a Happy Christmas in July! I'm always asked about where I find the things I decorate my home with and upcycle, so I thought it would be fun to share some of my Thrifting and Garage Sale finds on Thursdays. 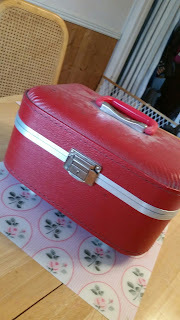 This past Friday I hit the jackpot when I came across THREE, not one, but THREE vintage suitcases. 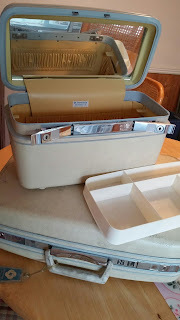 I picked up the two white cases for $7.00 and my initial thought was to resell them on a Glamping group I belong to on Facebook, but when I got them home, my daughter immediately wanted to use the small white case to store her beauty products at school. 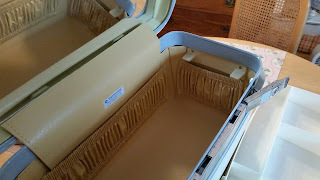 They both need a good cleaning on the outside, but the inside of the smaller case is in near perfect condition. When I asked the price for this smaller Red case and she told me .50 cents, I tried to hold my bluff long enough to pay her and get out of there! She obviously had no idea how in demand these pieces are at the moment. 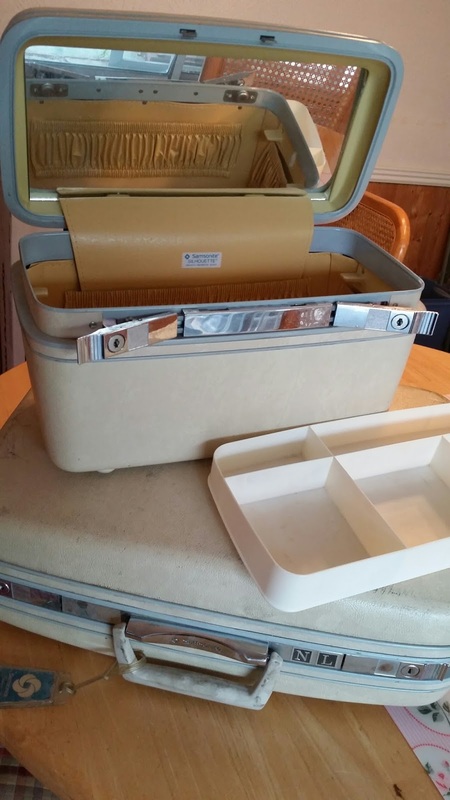 Again, I was trying to convince myself to it sell it, but also thought it would make a fun piece for camping. I don't see me actually owning Glamper anytime soon, but I can Tent Glamp and this would make my trips just a tad more fun. My intended color theme for Tent Glamping is Red, White and Blue, so this could be put to good use. 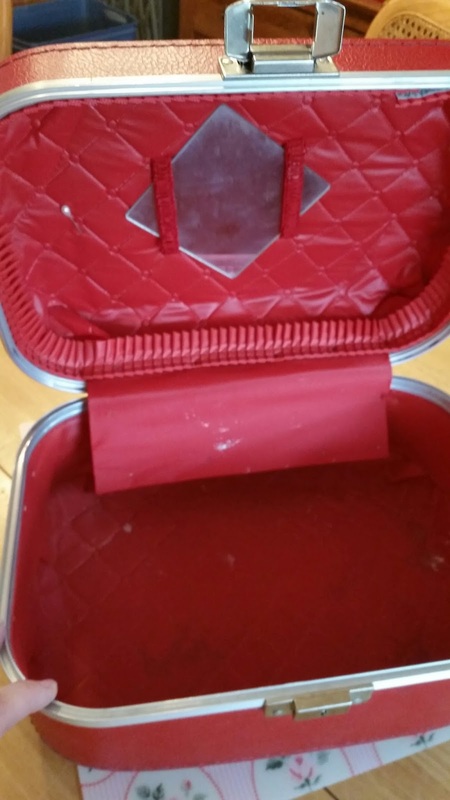 Right now I have a ton of Emergency supplies that I keep in an old draw string bag, why not just transfer the items to this small suitcase? 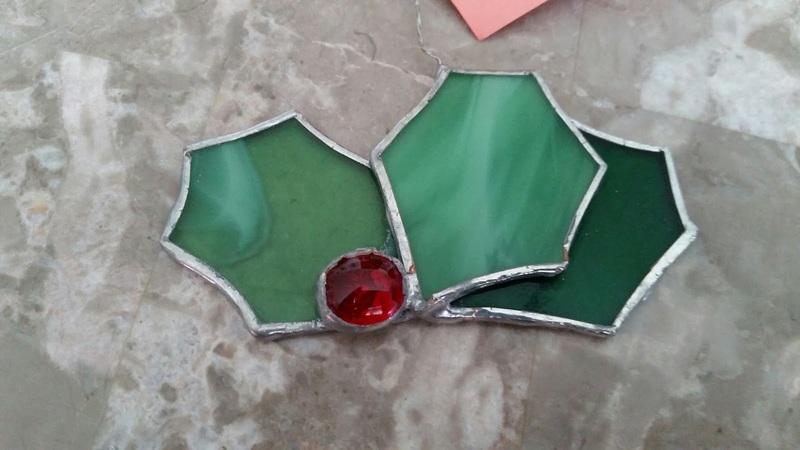 Ultimately, in a perfect world, I'll clean up the larger piece and still sell it to cover the cost of the two pieces were keeping. Considering I paid $7.50 for all three, I have no doubt that will be a problem. Right now, I just need to pull out a Mr. Clean Magic Eraser and get busy. I wanted to share some new 2015 stamp releases at the USPS. Last week at the post office I seen a glimpse of these new heart stamps on a poster and was excited to actually see one up close. They are a bit different, but I love the design. How perfect for a Valentine or wedding invitation. They are described as: Forever Hearts stamps depicts the ancient association between eternal love and the heart. 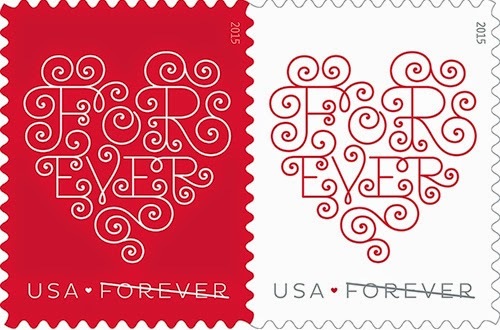 If the Forever Heart stamp doesn't cover the postage on your wedding invitation, these will! The drawings are details from engraved plates originally created by naturalist artist Maria Sibylla Merian (1647-1717). A small, deep crimson heart on each stamp brings a dash of color to the designs and makes them a natural pair. These stamps were printed using the intaglio printing technique. 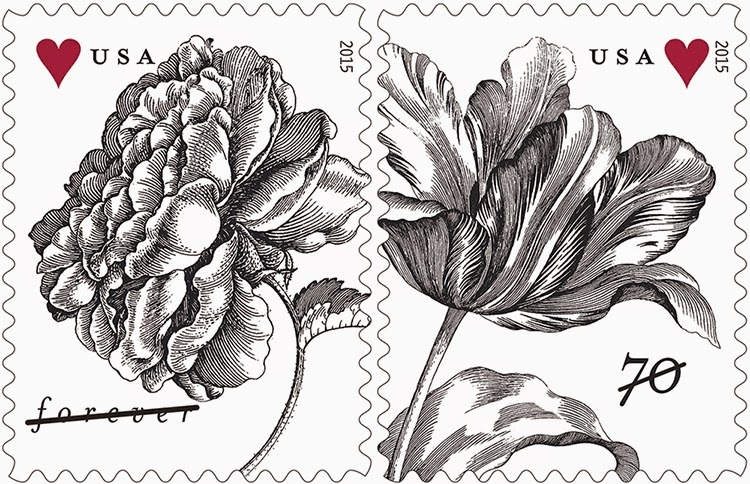 These Vintage Tulip stamps will be released on February 14th. 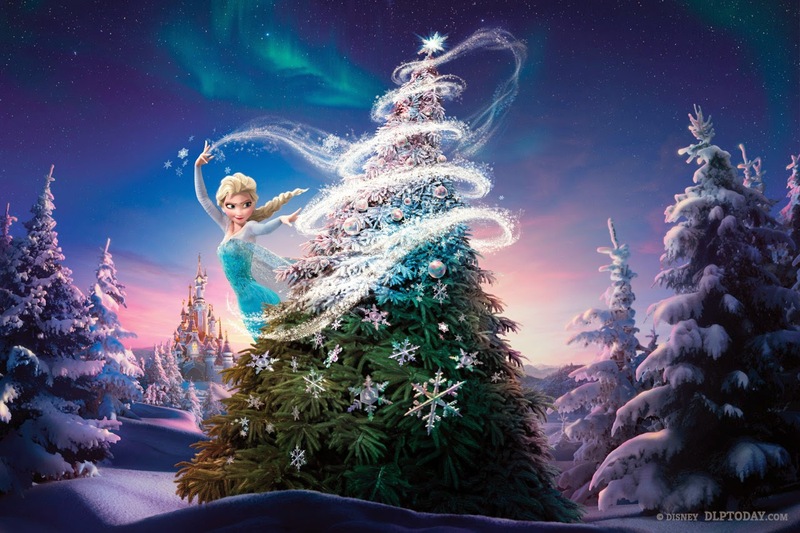 A "Frozen" Kind of Christmas...Lights, Music and Disney! When I seen one Frozen light display story in the headlines, I knew there had to be other families doing the same. Sure enough, families across America are utilizing the "Let it Go" phenomenon and delighting kids with some fabulous light displays. Here are just a few. Here are a few other videos. One direct from the Magic Castle and another is Idina Menzel and Jennifer Nettles singing Let it Go on the CMA Christmas Special. I really enjoyed that performance. 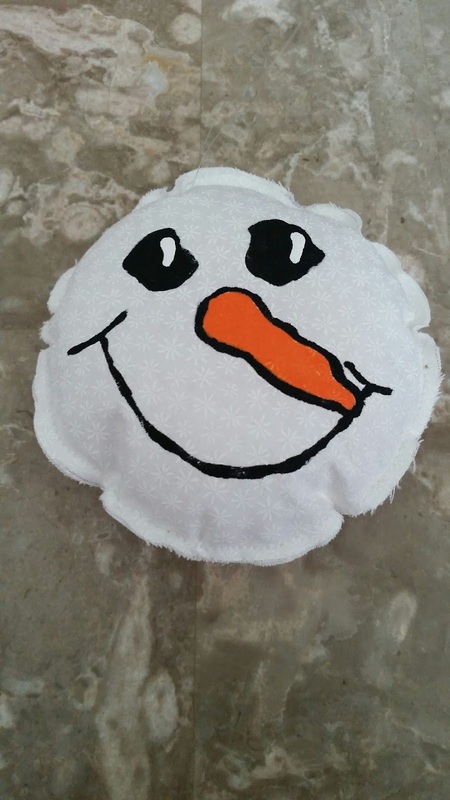 PS: I have to admit, the movie Frozen and a stuffed Olaf are on my Christmas Wish list. 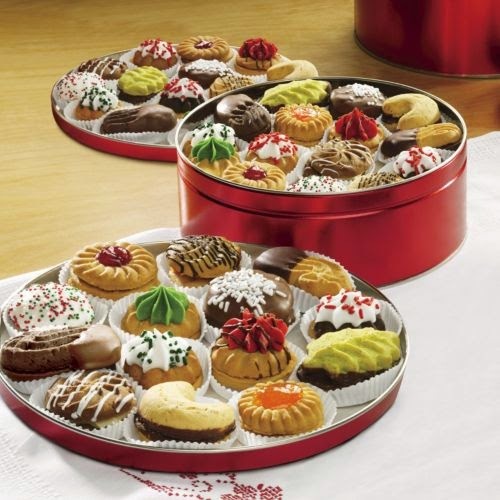 I just opened a Swiss Colony catalog that came to my office and there under customer favorites was a tin of Holiday Cookies. It instantly took me back to my grandma and how much I loved those fancy little cookies growing up. Every year, she would not only send me a tin of these special cookies, she'd also send me a box of oranges. Old school I know, but when things were often rough at home, things like this would make my Christmas extra special and sparkle just a tad more. She passed away when I was 16 and Christmas was always different after that. I think I'm going to order a tin of those cookies this year...and share the delight. My favorites by the way, are the green leaves with the chocolate in the middle and the double stack cookie with the red filling and jelly on top. I picked up a stack of Christmas CD's at the library recently and wanted to share my thoughts. First, I'll start with the four I wasn't to impressed with. Susan Boyle: I'll Be Home for Christmas, was not one of my favorite Susan Boyle CD's. I've always been a Susan Boyles fan, but honestly nothing stuck out and I haven't listened to it again. I was really looking forward to the The Seth Mae Farlane: Holiday for Swing CD, but found it pretty average, compared to some other swing style CD's I've heard. This was the only CD in my stack, that was a new release. Again, good, but not great. The Glee Christmas Albums: Volume 2 and 3 were good compilation CD's. They have a good mix of songs and talent from the show. Volume 3, even included a Hanukkah song. 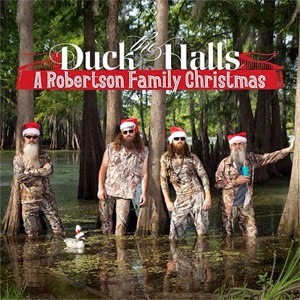 I was most curious to listen to the Duck The Halls: A Robertson Family Christmas. This one pleasantly surprised me. I wanted to go like it, but honestly thought it was going to be pretty bad. It's not going to win a Grammy, but I'd describe it as FUN. It's something different and something I think may give you a few giggles. It's starts off with the song Ragin Cajun Rednect Christmas, sung by Willie. I'd say..its not bad and not great. The title will tell you exactly what it's about, but it was fitting that the "Commander" started off the CD. Track #2 was I'll Be Home for Christmas, sung by Missy Robertson. This one surprised me the most, because she can sing. They have several songs with guest, so when I heard this song the first time, I actually stopped to check out the credits. Track #3 is Uncle Si "singing" You're a Mean One Mr. Grinch and a perfect combo I thought. Track #4 is Christmas Cookies with Phil, Miss Kay and George Strait. It's all about the real "sugar" he gets from Miss Kay, while the cookies are in the oven. Phil doesn't really sing, he more talks his way through the song, but it's one of my favorites on the CD. 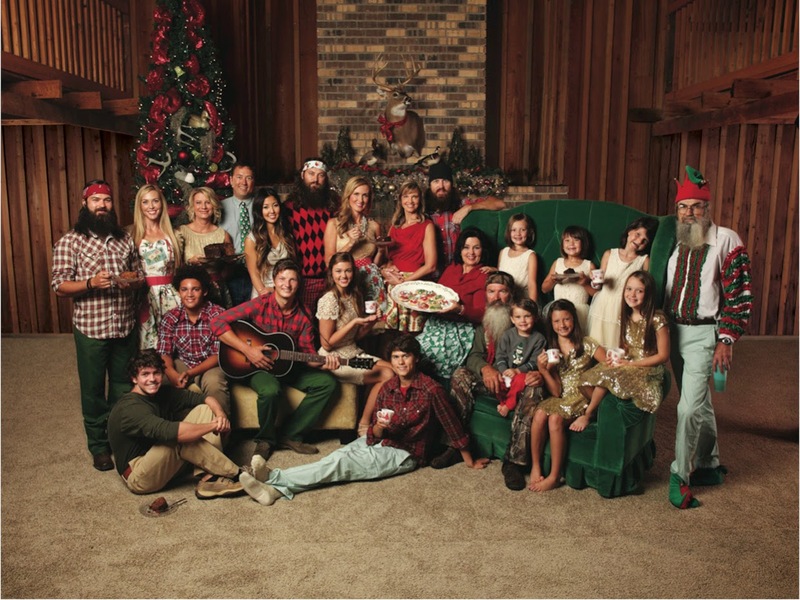 Track #6 is another fitting original called Hairy Christmas, with Willie, Luke Bryan, Phil, Uncle Si, Jase and Jep. The first verse sets the tone, for an entire song about rednecks, beards, shotguns and Jesus. A lot of love and a pot of gumbo"
Track #11 is The Night Before Christmas; Uncle Si Style. He reads his way through a story about Willie being all "Chubby and Plump" and bringing toys and goodies for everyone. The CD ends with Silent night sung by the entire family, Phil doing a closing prayer and Willie doing a closing statement, similar to the TV show. My final thought on this CD, is how fun it would be to own a piece of cultural, Christmas memorabilia. A Hello Kidney Cake... A Special Celebration! 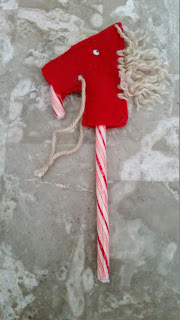 Hollywood Nutcrackers: I love these things!